One of my favorite Super Nintendo games to play with my brother was Teenage Mutant Ninja Turtles: Turtles in Time. We played the arcade version, too, as many of you no doubt have, so we're both excited for this Xbox Live Arcade remake. Watch clips of the first two stages in the following video. Today is the date that the sales numbers for the game industry are posted for the media to see and console warriors to embarrass our industry even further. Rage on, console warriors. Rage on! Numbers are courtesy of console warrior HQ, NeoGAF. This marks the first month since February 2007 that Wii Play is not in the top ten. If only Nintendo had a sequel planned for two of their biggest hits, Wii Sports and Wii Fit, to continue the great sales! That was sarcasm by the by. THQ did well last month having two of their games chart, UFC and Red Faction. EA's back in stride with Tiger Woods and EA Sports Active for Wii, as well as two SKUs of Fight Night Round 4 for the HD twins. Two months ago we looked at some of the Wii's most overlooked games. You can find part one here. Apparently, the Wii has a lot of them since here's a whole new second part to go with it. Hopefully this list encourages you to seek out some of these titles you may have missed out on. Released in May for a budget price of thirty dollars, Klonoa is a remake of the original platformer, Klonoa: Door to Phantomile. With enhanced graphics, new moves, bonus content in the form of new challenge chambers and costumes, and you have a game that deserved more attention... especially from Namco-Bandai's marketing department. The game might be short, but just like platforming bliss like Super Mario World, you'll want to play through this beauty more than once. Another game that Namco-Bandai felt would sell on its own (and failed to do so) is The Munchables. These folks are a group of hungry gluttons eating up anything and everything to grow in size. A mix of Pac-Man and Katamari Damacy, the trick with the game is to gobble up enemies so you can get larger to reach new areas. The amount of enemies eaten may be high, but the amount of money you can get this game for isn't. It's also budget price. 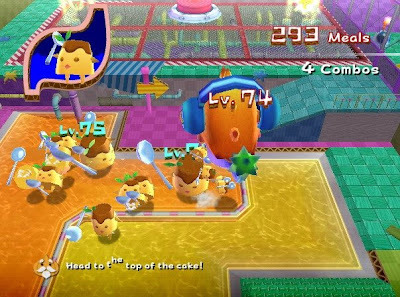 A near-launch game for the Wii, Elebits was similar to Katamari Damacy as the more energy you sucked up, the higher powered your special Elebits vacuum would become, allowing you to access new areas of each level. 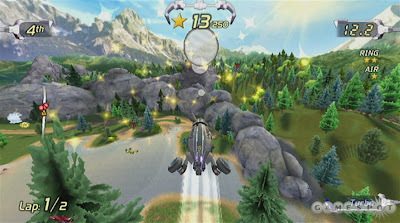 It was one of the first Wii games to use the pointer almost exclusively for point-and-shoot action. Sure, it was rough around the edges, and I'm still hoping Konami will give a Wii sequel a try. From the same team that brought you Elebits comes Dewy's Adventure. This is more your typical platformer game with an isometric camera following Dewy through each level. You titled the Wii remote to slide Dewy around. 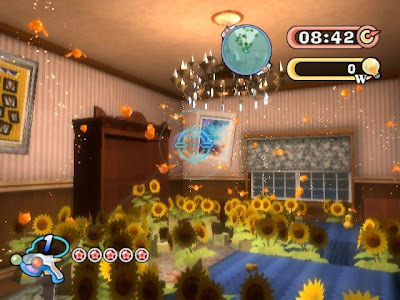 Visually, the game is still a joy to look at with cool special effects such as the glistening of Dewy's body as well as bloom when Dewy used his heat powers. Overall, this is a great game to pick up now for the price of twenty dollars. I consider Super Monkey Ball my favorite roll-to-the-goal game. Kororinpa came out of nowhere and bested the disappointing Super Monkey Ball: Banana Blitz. You hold the Wii remote like an actual remote, twisting and turning the game world to move your marble around in over seventy different labyrinth mazes. A sequel came out which is your best bet though it isn't as good as the original. Then again, the original is now one of the rarest Wii games around. There's a theme with the games on this installment's list: they all had little to no marketing. Perhaps that's a sign of some sort. Regardless, Excitebots: Trick Racing took one of my favorite Wii launch games and made it even crazier and more hectic. Online play was included this time around for six racers to compete simultaneously. The only things really missing was bots for local multiplayer and some actual advertising from Nintendo. 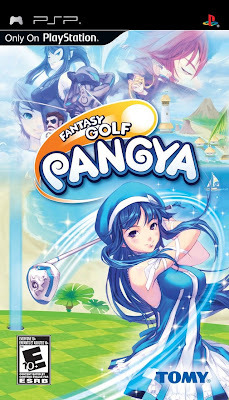 PANGYA: Fantasy Golf came out for the PSP last month, and I've played through enough of the game to write up my verdict. You know, between the DS and PSP, it's really a contest towards which I prefer! That discussion is for another day-- here's my review! 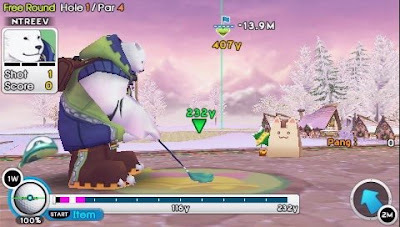 PANGYA: Fantasy Golf is a PSP version of Albatross18, an online golf MMO that's incredibly popular in Japan. Here in the West? Not so much. 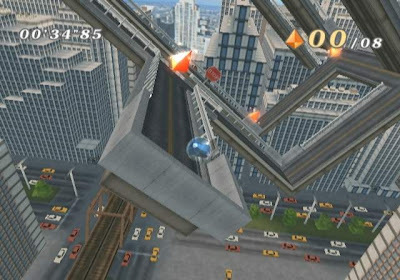 Since its release we've seen two console versions of the series on the Wii under the guise of Super Swing Golf. 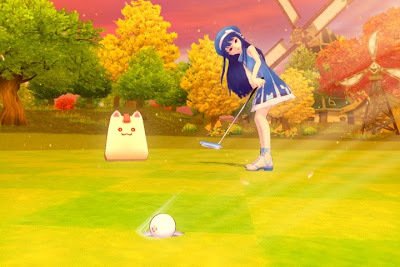 The North American publisher has switched hands from Tecmo to Tomy, so now we have a brand new name for a brand new installment in the series-- PANGYA: Fantasy Golf. Is this game a golfer's fantasy, or is it more of a nightmare? 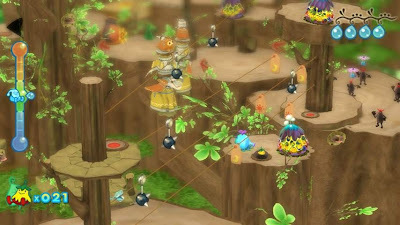 Pangya is a game a lot like Earth's golf, but the course design is more imaginative, the cast of characters is more wacky, and the abilities of each player are much more fictional (e.g. hitting a ball around a lighthouse at a sharp arc to the left, so it lands perfectly behind the lighthouse). It's certainly a wacky sport. What else can you say about it when the beginnings of the sport revolve around a hero hitting a magical ball into a hole in order to plug all the evil coming out of it? Not much is what I say. With phenomenal shots, extravagant course design, and giant white bears playing alongside human loli-girls, this isn't your father's golf. It's pangya! Has to be an Eastern game. There's a lot of content to play through in PANGYA: Fantasy Golf, and the first is the Story Mode. 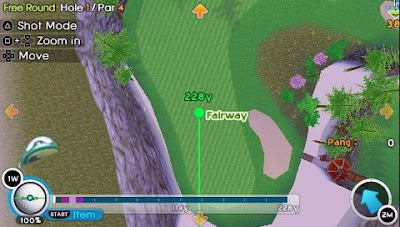 Story Mode is one of two main areas of PANGYA: Fantasy Golf. It follows a ragtag group of characters each with their own reasons for coming to the mystical island to play pangya. There are two episodes to play through. First you complete the original eight character's story modes, and then the second episode opens up featuring brand new characters to play as bringing the total to eighteen. Once you complete a character's story, you'll unlock them for use in the other modes. The characters range from a galactic cop after a loli-pirate, a beer-bellied police officer whose heart is his guide, a cute aquatic creature named Dolfini, and many more. Each character has a set number of matches to play through. Some only have five story events while others may have seven or eight. The events are either three or six hole match play games or a nine hole tournament. There's also tutorials to master your swing, learn new shots such as the powerful Tomahawk and Cobra shots, and get a feel for a new expanse of the game. 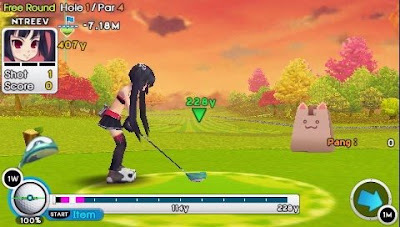 The other main mode of PANGYA: Fantasy Golf is the Tournament Mode where players go against the field on all nine courses for nine or eighteen holes of golf... er... pangya. Victory rewards a brand new costume set for your character to wear as well as prize money in the form of pang. Some of the early tournaments are no sweat, but later tournaments can become increasingly more frustrating as your opponents seem to get overly lucky-- an eagle here, a hole-in-one there. You have to play at the top of your game or get lucky yourself to have a chance at winning. Of course, you have to earn the right to compete in a course's tournament first. things out is a change in perspective. License mode is where this happens. You get a choice of a flurry of different events to partake in each with a different experience point value. Complete the event to earn experience points. Accumulate enough experience, and you'll unlock the ability to play in tournaments for that course. Events include challenges where you need to reach a specific score or amount of pang before the round ends, approach matches against other players, and chip-in and hole-in-ones challenges where you get ten shots to reach the cup in one. There's more than enough events that you'll seldom get stuck being forced to play the most difficult ones just to advance. Speaking of pang and costumes, for each action you perform on the pangya course, you earn pang, the currency of PANGYA: Fantasy Golf. You get pang from tournaments, yes, but you can also accumulate money through normal play. Drive your ball further than expected? Have some pang. Sink a chip-in shot? Here's some pang. Get a par, birdie, eagle, albatross, or hole-in-one? Nope. No pang. Psych! Here's a load of pang for you. You get the idea. Pang can be used to purchase new attire to customize your pangya players which can be mixed and matched accordingly, buy new golf equipment such as club sets and aztecs (the golf balls of pangya), and to play the lottery game for new items and rare costumes. Wearing a new wardrobe during a round nets you a percentage boost from your pang round total for even more pang to spend. 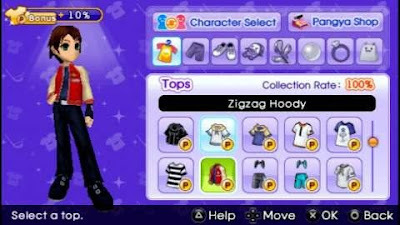 Each character has a multitude of different costume combinations. Sure, you have to play well to earn pang, and you have to master the multiple venues of the island if you want to earn loads. There are nine courses in all in PANGYA: Fantasy Golf, and they really put the fantasy golf part of the game's title through the ringer. The first course, Blue Lagoon, immediately does away with any design Jack Nicklaus would ever come up with. There's holes where you're driving the ball from island to island, holes where you need to chip the ball around the boundaries of a whimsical castle, and tons of bunkers and water hazards to contend with. Each course has its own theme from a valley full of dangerous windmills to playing on the soil of an active volcano with lava flowing near your feet. These are courses even Tiger Woods might not want to tackle. Still, not all is well with the course design. Early on you'll have par 3s that will take you two shots to reach the green when they should traditionally just take one, and par 4s that require three shots to even have a chance at the green. Thankfully, there are tricks to shortening the amount of strokes it takes otherwise there would be a bigger problem. 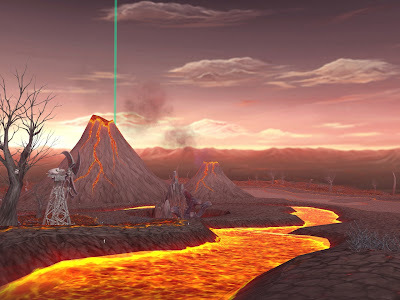 volcanoes and their flow of lava. Thankfully there's no problem with PANGYA's controls. 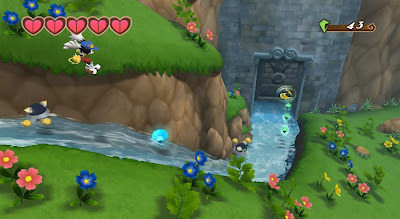 The game uses the traditional three click method. The first click starts the meter, the second sets the strength of your shot, and the third sets the accuracy. Special shots such as topspin, backspin, and fantasy shots like the Cobra and Tomahawk are performed by setting where you want to strike the ball via the PSP's analog nub, pressing a direction on the d-pad or tapping the shoulder buttons before the gauge passes halfway on the way back, and making excellent contact with the ball. It takes a bit of skill in order to accomplish the trickier shots PANGYA throws at you. The traditional three click system is used for PANGYA. PANGYA: Fantasy Golf has an adequate amount of appreciation dedicated to its presentation. Visually the game isn't as technologically impressive as the Hot Shots Golf series on PSP, but it's no pushover either. There's a ton of jaggies that abound. Some of the girl characters' legs you could dice onions on; that's how bad it can get. There's some graphical glitches with the camera. Sometimes the underside of holes can be seen or a choppy wall allows you to see through it. There's no voice acting which could have brought some life to the characters. Thankfully Story Mode does an adequate enough job of doing so, but it isn't necessarily enough. The lack of a saved shot feature is a missed opportunity. Being able to review your favorite shots such as an awesome albatross from 250 yards away would have been a great feature, and it's something I think golf games nowadays should have as a standard feature. All in all, PANGYA: Fantasy Golf is a terrific vision on the game of golf. Its single-player content and the bevy of it will make you forget all about the lack of online play and the game's shortcomings. Well, maybe not ALL of the game's shortcomings since all of them lie within the single-player modes, but you catch my drift. The amount of costumes and goodies to unlock will takes days of game time to unlock, and only with practice will you best the more advanced challenges PANGYA has to offer. For folks who enjoy the Hot Shots Golf or Mario Golf series, PANGYA: Fantasy Golf may just be your next golf-like addiction. What is "SuperPhillip's Favorite VGMs"? It's a segment where I post my favorite video game tracks. Any console, any series, any game, any version is acceptable! This week we're checking out two types of kingdoms as well as some old school Mario, Klonoa, and Mickey Mouse! This is the happy-go-lucky theme of the Birabuto Kingdom, the first world of Super Mario Land. Let its cheery melody take you within a whirlwind of nostalgia. This theme plays during outside portions of the second level of Klonoa 2: Lunatea's Veil, La-Lakoosha. It's a mildly mellow song with a multitude of great parts. The Playstation 2 has a ton of fantastic yet overlooked games in its library. If you can track this title down, pick it up for some platforming goodness! We go from one overlooked PS2 game to another. Known in Japan as Rakugaki Kingdom 2, Graffiti Kingdom is the sequel to Magic Pengel: The Quest for Color. Both games are overlooked which is understandable as the Playstation 2 library is full of fantastic games. Testing My Ability is a fast-paced track with a folk flair to it. Yasunori Mitsuda hits one out of the park yet again. From one kingdom to another. The damned being the Beast of "Beauty and the" fame. This tune plays in the Beast's castle world of Kingdom Hearts II. It was one of the first songs that I was humming to as I was playing way back when the game was released. Hope you find yourself humming to it, too. From a game Mickey Mouse had a cameo in to a game where he was the lead, The Magical Quest Starring Mickey Mouse was a fun if not short platforming romp for the Super Nintendo. It was also released on the Game Boy Advance almost a decade later. This song is from Snowy Valley, the second-to-last world of the game. That does it for another Monday with SuperPhillip's Favorite VGMs. They'll see you next week for five more favorites.